For the past 15 years — beginning in New York and expanding to Miami, L.A. and recently Chicago — we have published the independent, in-depth and award-winning reporting and analysis that millions of real estate, finance and legal professionals, among others, rely on in print and daily on the web. 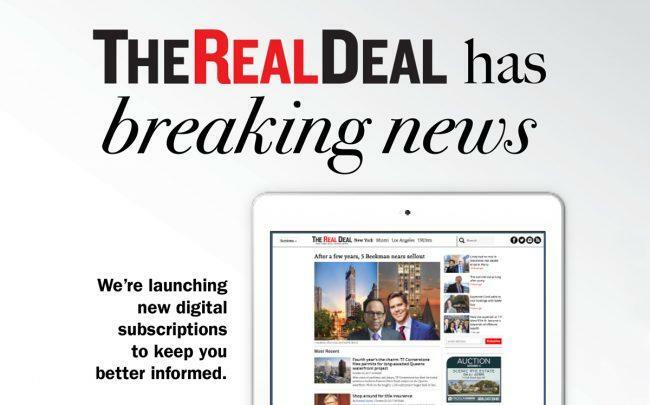 Now, we are asking our readers to join us in the next phase of TRD as digital subscribers. Readers who consume more than 15 articles a month across our network of sites will need to join our digital subscription program to continue reading. And we’ll keep adding to the list! We also have a corporate subscription program with tiered rates for organizations needing 10 or more accounts.Please contact corpsubs@TheRealDeal.com for more information on that.